In this holiday season, we tend to look back to those times of being a kid and all the excitement of the holidays. I have been on this strange mission of finding images that bring back those good times. Not obvious images, but subtle ones. 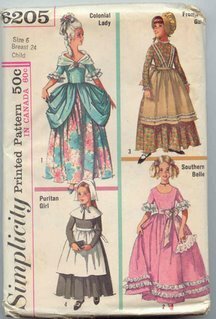 I been searching ebay for old vintage patterns and found two very familiar patterns that brought back such joy when I found them. Halloween costumes that Mom made for us. 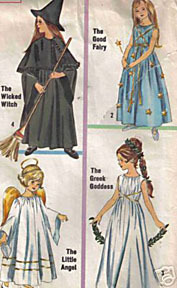 I was the little angle, and my sister the fairy princess in blue. I thought that one day I would grow and get to be the Fairy princess...but I don't remember letting to be her. I remember being pooh a couple of years as well as a teddy bear..the old costume in the box with plastic mask version. I was of course the pilgrim one year. It converted into an old fashion gal for a bit part in a Christmas play at school.